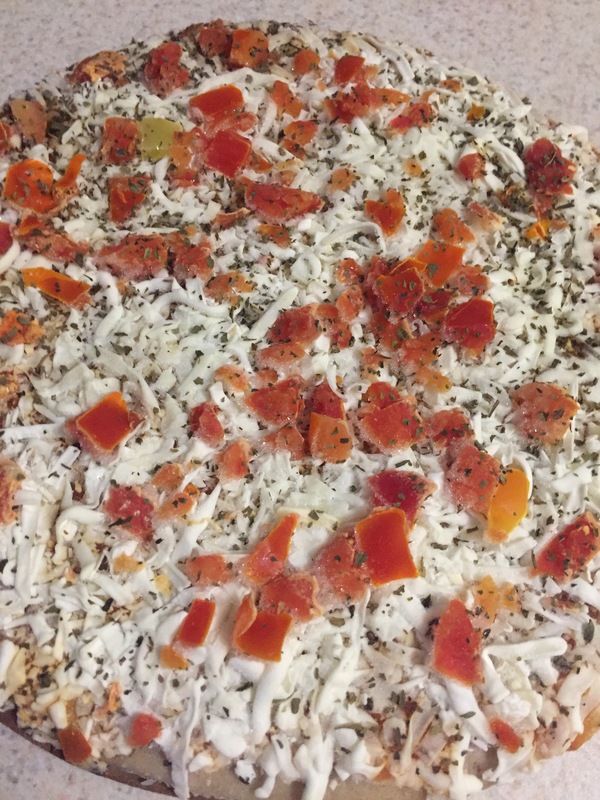 So in a post last week I talked about a frozen gluten free pizza that was very tasty. This week I’m telling you my review of a mainstream gluten free pie. We have pizza at our house almost every Friday night. It’s one night when we have a family meal and it’s just so special to me. 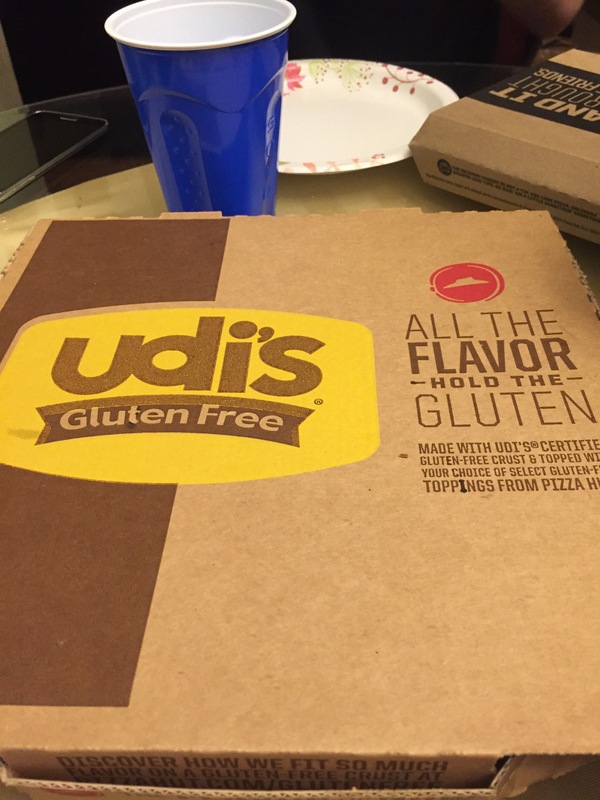 Well this particular week (last week) we chose to order from Pizza Hut because they have a gluten free option. Yep that’s right they use an Udi’s crust and well the toppings are still very much Pizza Hut. I ordered the meat lovers because meat! So as you can tell from the picture the Crust is very thin and thus very crunchy. Not my favorite kind of Crust. 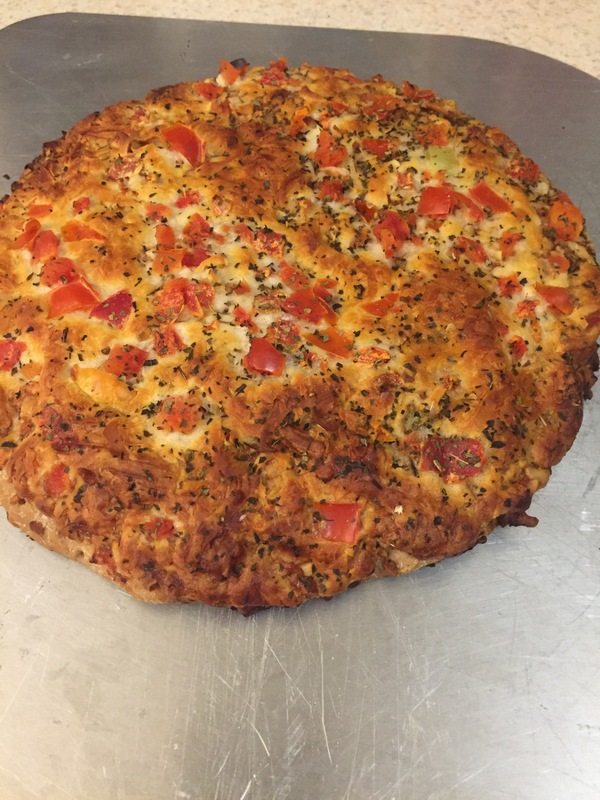 If you are into thin crust already this pie is for you! If you like a hand tossed or even a NY style pie I’m afraid your enjoyment of this pie will be about like mine – seriously lacking. So I guess the verdict is if you really want a gluten free pie and you are already ordering from Pizza Hut go for it. 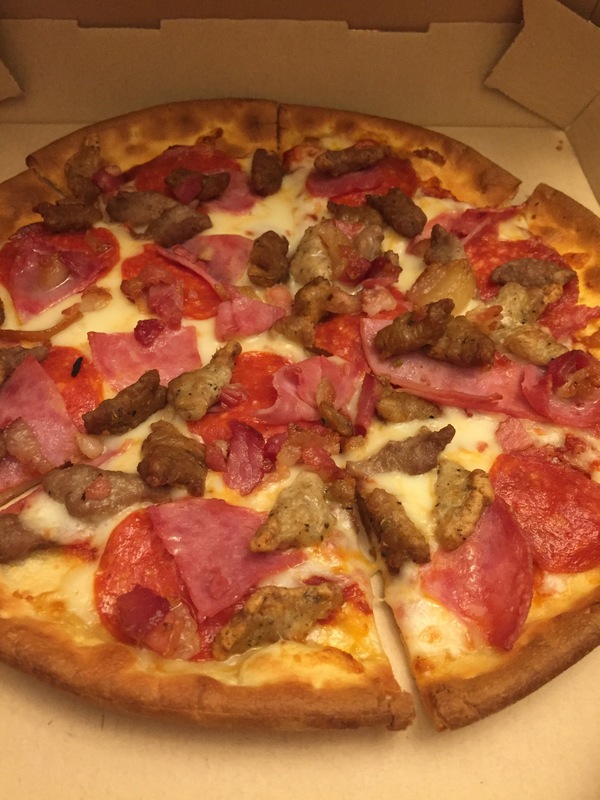 You will get the same sauce and toppings that you have always known and loved from The Hut! But if you are not a fan of thin or crunchy Crust I would suggest skipping this pie. I know most of my reviews are very positive but I have quite a few gluten free friends following my blog so I really want to be honest above anything and tell you about my real experience and unfortunately sometimes that experience isn’t good. I have decided that I can not have Gluten. It makes me feel bad and my body just really is not happy when I have gluten. But herein lies a problem because some of my all time favorite foods are gluten bombs just waiting to happen. Let me just provide you with exhibit A: PIZZA. Now a glorious New York style pie (super large piece, thinner crust that can be folded with lots of cheese). Now in my home town of Nashville, TN there is not a lot of NY style pie to be found but pizza in general just does it for me. I get excited and happy and relish in every bite. So not being able to have gluten has created a problem for me. There are multiple large chains that have recognized this gluten phenomena and have responded in kind with gluten free crust options, I’m looking at you Pizza Hut and Papa Murphy’s. And their pizzas are good, I will do reviews for you one day for those specific companies but today I’m talking about the good ol frozen pizza. This is anther type of pizza all on it’s own. You get a frozen pizza and there are steps to ensure proper enjoyment. First you must have a dipping sauce. Sometimes that sauce is buffalo and sometimes that sauce is Ranch, sometimes it’s just plain ol Ketchup but it’s a requirement people and these companies know it. So if I’m not doing a pizza with all of the meat then this is my go to. Margherita. It’s just fun to say right? So I could go into all the details about what’s in it and the nutritional information but that’s not why you come to this site. You come to my page to get the real scoop, the flavor scoop. So here’s a link to the company’s website with the specifics on this pie. When I opened the package I was nervous to see what it might look like. It’s always scary when you try something for the first time isn’t it? Here’s how it looked. I really loved seeing all the spices. It just makes me happy to see spices. Not sure if that’s normal or not but it’s the truth. So I put that bad boy in the oven. And waited what felt like forever but then the amazing smell of pizza started coming from the oven and then I waited too long because the cheese didn’t quite look melted so I think I may have cooked it too long but here is the result. Slightly browner and crunchier than I would normally like but the flavor was there. Everything was tasty about this pizza. I could have probably used a little more cheese but I think that if I hadn’t let it get quite so brown I would have had plenty. All in all this was a great frozen pie and I would highly recommend giving this brand a try. The crust had a great flavor that was not cardboardish at all. And trust me not all gluten free pizza is created equal. Mangia my darlings. Until next time. 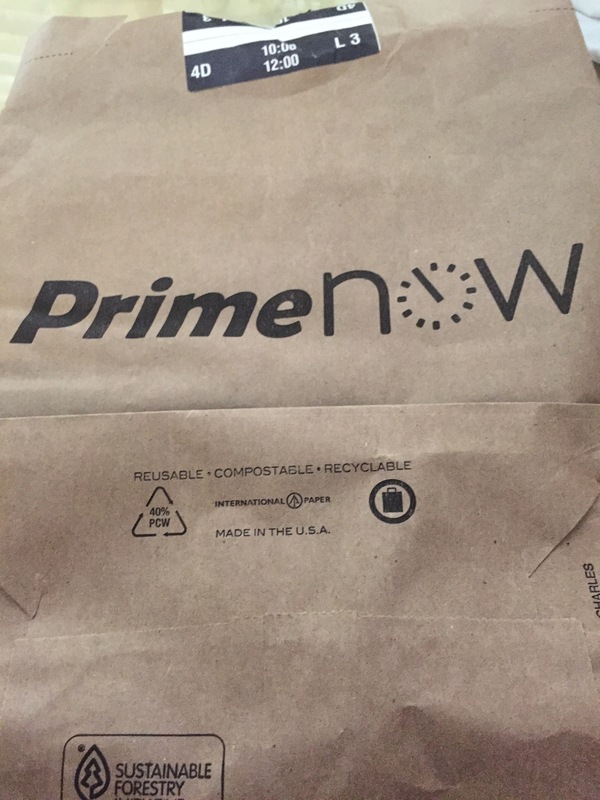 So you may not have heard about it but there is a service called PrimeNow. This service is home delivery of all kinds of things that you need including groceries and even of the perishable variety. I convinced my husband we should try it. I wanted to make bread and we were out of eggs. So I loaded the app on my phone and started hunting for stuff. There was a $20 minimum order which to my understanding can vary by location. So I found things we needed including a case of water and then decided to throw in ice cream for good measure (let’s see how melted it is when it gets here)! 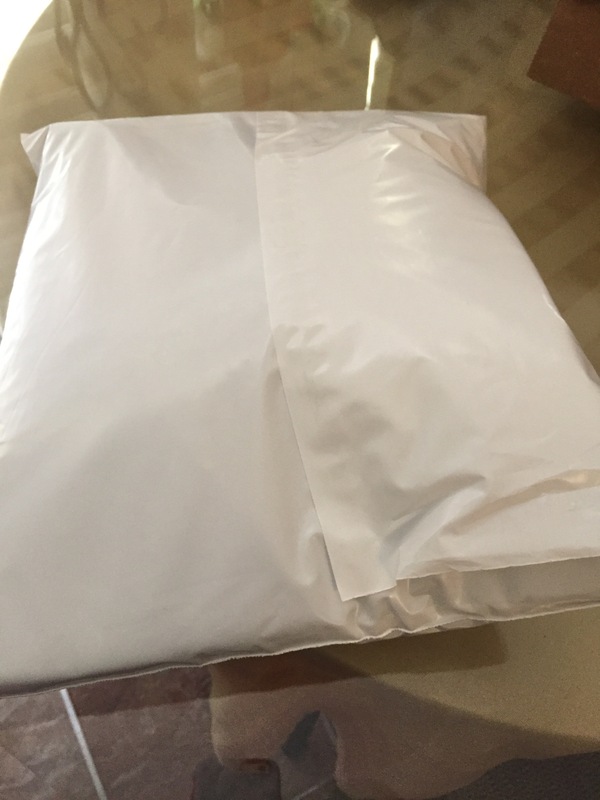 My order was placed at 9am and I was given a window of delivery from 10-12. I went about my day and at 11 I had a notice my delivery driver Tom was on his way and I could even track his progress on the app. He arrived at 11:20 with my groceries. 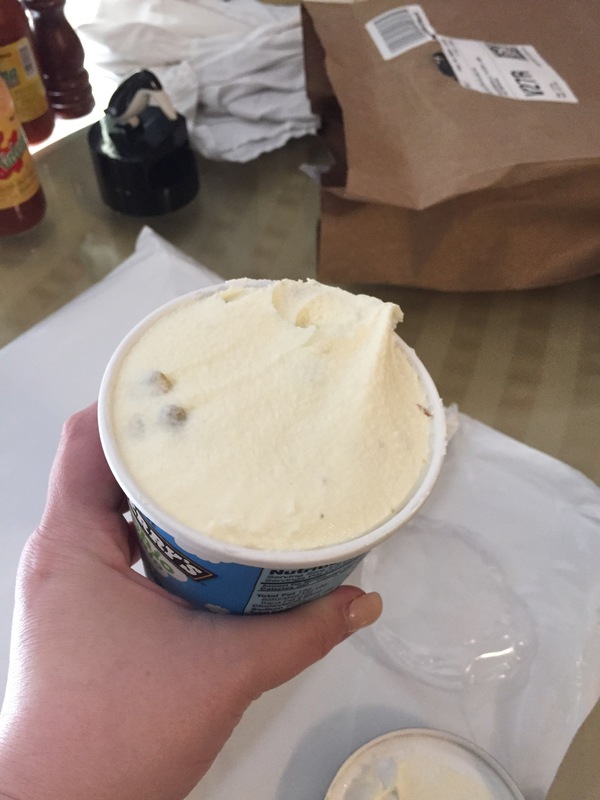 And when opened the container was cold very cold and this is how the ice cream looked. The app also lets you go ahead and add a tip for the delivery person which is great. None of the groceries were a higher price then I would have paid in the store. All in all this was a fantastic experience and one I would recommend. 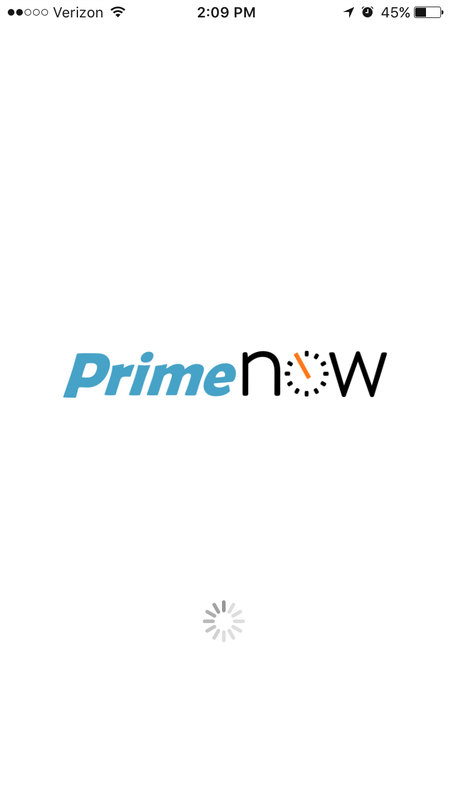 If you have Amazon prime already this is a free service and I highly recommend giving it a shot. Some of us are just born loud. We are loud from the moment we take that first breath. We are constantly having to be moved to a different seat in class because they think that will help but guess what, we will talk to anyone, even ourselves if that’s how we have to survive. And many of us that are loud are often drawn to others that are loud. It is like a secret club, and volume and persistence is the secret knock to open the door. This is my explanation for being drawn to reading actress Leah Remini’s book Troublemaker – Surviving Hollywood and Scientology. I have been drawn to the actress since the first moment she appeared on Who’s the Boss back in the 80s and when news broke that she was releasing a book, I couldn’t wait to read it. Due to my time management and schedule I didn’t end up getting to “read” this book but listened to it on audio book. The first thing I will say in my review is that the audio book is read by Leah Remini and well that’s a requirement. Her voice and inflection and her true personality come through in every single word. It is clear that she knows who she is and she’s good with it. Her book is really her story. Her experiences are clear and she provides an honest reflection of what she witnessed in her life. Her truth as she knows it draws you in and makes you feel like you know her and you experienced it with her. I found it interesting that this was not an attack on Scientology at all. This story was hers and it was honest in that she had a religion she completely believed in and was committed to including in her life and when she didn’t like things that were happening she had to really step back and make some very hard decisions for herself and for her family. Are there things that some of us would have found unbelievable and horrible and couldn’t understand because it’s not how we were raised, sure. But again each religion/denomination has their special practices and beliefs that are foreign to others. She shows how for her this was normal and then when it became something she had to question, she did. She used her voice and she was afraid to be a “troublemaker”. And that is in my opinion what makes her so special. If you want to experience an inside look at life, Scientology and a little taste of Hollywood, I highly recommend you check out this book. If you have the time and can listen to the audio version I would recommend that even more. Leah’s voice will draw you in and make you feel a part of her story. I have decided that if I ever get to meet her, I would just like to hug her and say “Well Done!”. She would probably hate that, but well I’m a hugger. She impressed me and I wish she was one of my friends. So if you have a chance in your own life to be a Troublemaker, I would have to say go for it. And when that moment comes just know, you can do it too. For more information please find Leah Remini’s website: here and to order your own copy of the book please go here.